The new year has definitely shown improvements as we've had a pretty good month. We did start off our goal-filled month with a decent draw against Chelsea considering it was away from home where the final score was 3-3. Following that match, we had to play Colchester in the FA Cup 3rd round which was an easy routing for our under 23s and Lukaku. We had another cup match after that with our seniors rested following the Colchester match, but we could only get a draw which I'll take since away games are always the toughest. After our Tottenham game, we played Everton in which we recorded a 5-2 win at home showing our attacking prowess and followed that outing with a 3-0 away win vs Bournemouth. We then saw Marcus Rashford score 4th consecutive game (would be 5 if you included the ones he played in since he was not playing vs Colchester). Our Croatian youngster, Antonio Marin who is definitely one who's definitely going to be getting more first-team football next season after he impressed me with his performances considering the fact I nearly let him stay for an extra season at Dinamo for game time. Now that we have advanced to the League Cup Final which is to be played in February, we had another cup match to focus on as we only managed a 0-0 draw against Brighton after our run of games. To end off the month, we finished off newly-promoted Cardiff City with a 2-1 win where Martial and Rashford got the goals. 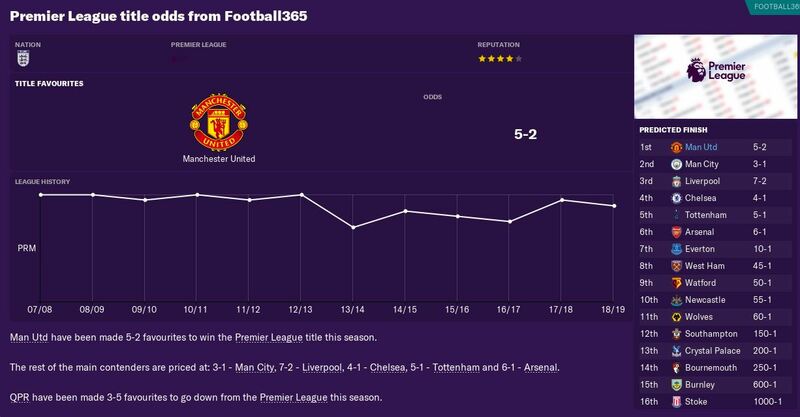 Overall, it was a good month as we won all of our matches that we needed to (except for the tough away game vs Chelsea) and will hopefully/made up for our draws in the League Cup semi-final second leg and hopefully the FA Cup 4th round replay (since I can't give spoilers away in the wrong month). We're now only a point off the top 4 and just need to overtake Arsenal as we sit 5th in January. I think we've definitely found the right tactic eventually as you cannot argue that we've been outstanding when it comes to attacking. We started off with wins on the road against Southampton and Brighton and followed that up with an amazing 3-0 win over league leaders Liverpool which asks me why we're not even in the top 4. We kept up that good form with a 3-0 win over Hull City to advance to the FA Cup quarter-final. 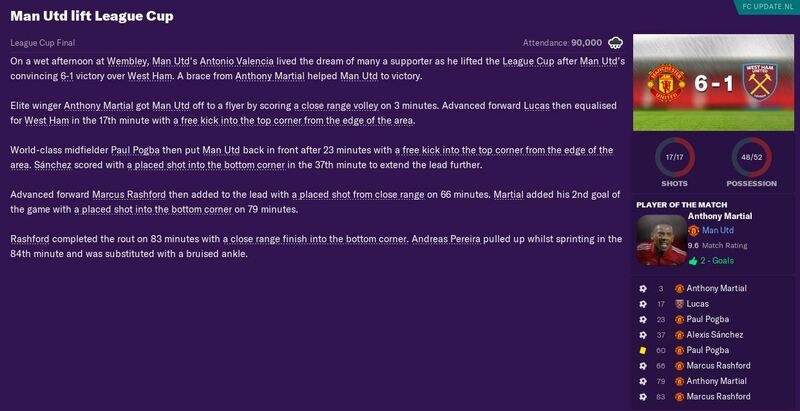 We did only get a draw against Valencia in the 1st knockout round in the Champions League, but we got our first trophy as a manager as we absolutely annihilated West Ham 6-1. 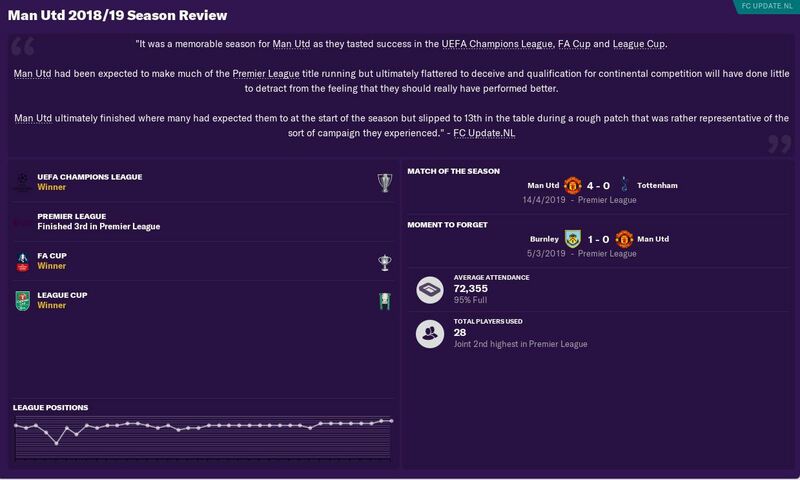 In typical "coincidental" Football Manager fashion, we play West Ham again and we smash them only a few days later after their heartbreaking 6-1 defeat in our 4-1 win. Caps off a wonderful month in which we've hopefully found our groove. We've finally got a chance of making the top 4 as we have a game in hand against Arsenal, and if we win our next match, we advance 1 point ahead of them in the table. 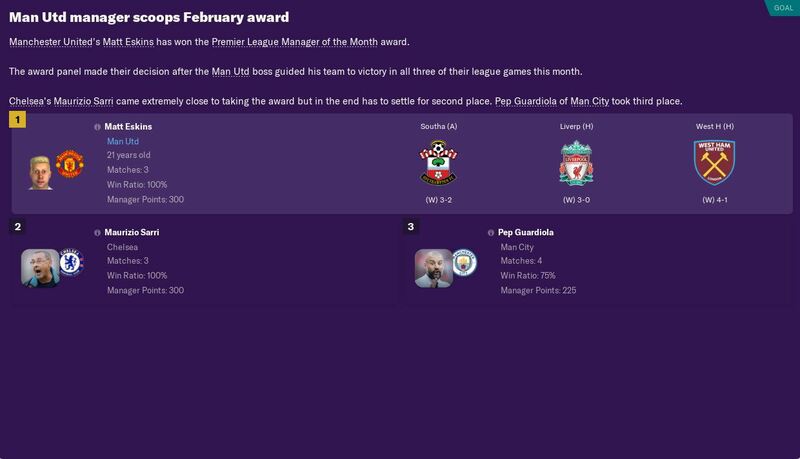 Great month as we've won all our Premier League matches and we definitely deserved it as this was the month we smashed league leaders Liverpool 3-0. Great game here as Rashford, Martial, Alexis and Pogba smash West Ham. We've had a decent youth intake here, nothing special but we did get a 5* potential goalie who I'd love to be getting some experience out on loan as there's no way he's going to be challenging De Gea for a while. We also have Pabos Michail who could become good after a while. A bad start to the month but we fixed a little thing in our tactic and it's looking like we can use this one for a while to win. I wasn't too pleased with our 1-0 loss to Man City which could prove very important to finishing higher in the table while dropping full points at Burnley is a real bummer. Once we rescued a draw against Newcastle thanks to an 89th-minute goal from Antonio Marin, we ended out getting through the FA Cup quarterfinals via a 120th minute Lukaku penalty but what happened at the very end of the month shows that we've found a perfect tactic with perfect instructions as we annihilated Leicester City 4-0. We are in the top 4 now which we essentially need to keep our jobs because if we don't qualify for next season's Champions League (unless we win this year's edition), we are highly likely to get sacked. While Man City are 6 points ahead of us, Chelsea is only 1 but they have 2 games in hand so they can easily get 7 points ahead leaving us stranded in 4th. We proved to everyone that we are starting to play high-quality football as we beat Fulham 5-1 away from home who are fighting for a top-half finish. After that match, we advanced to the FA Cup final following our 2-1 win over West Ham. Next up on the fixture list was our Champions League quarterfinal and we lost narrowly away from home 1-0 but immediately bounced back with a 4-0 thrashing of Tottenham. 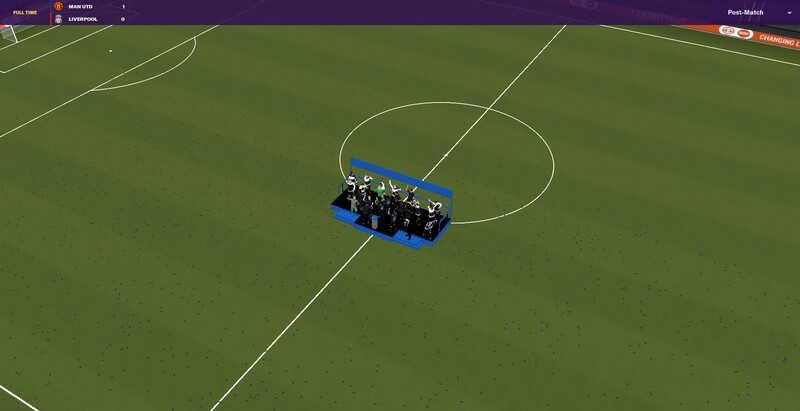 Somehow, we managed to beat Atletico Madrid 5-0 in the 2nd leg who's hopes were crushed of making the final where they could've played at their home stadium. We then followed it up with some sound Premier League performances in our 4-2 and 6-3 win over Palace and Arsenal, respectively. 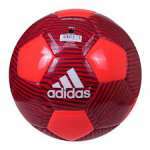 This now means we scored 19 goals in 4 matches which is an amazing feat and shows we have lots of attacking class. Since we had to rest some players for PSG match, we fielded a weaker line-up but showed our depth as we managed to beat Wolves 2-1 who are vying for a Europa League spot. Something bad did happen during our great month as Andreas Pereira damaged his cruciate ligaments in our 6-3 win over Arsenal and might only be back to proper full fitness by the end of the year and we're probably going to sign a world class CAM anyways as we really need to strengthen that position as Pereira who is only decent ability there doesn't suffice and he might even become Championship quality after his long injury setback. 2 EPL matches left to play and we're only 2 points off Chelsea so if they slip up we've got a chance of somehow finishing 3rd and even the same with City. We start off May with a 2-0 win over Brighton and follow it up with a smartly played 0-0 draw with PSG which we knew if we at least draw, we'd advance due to away goals unless we had a 3-3 draw or something. After that match, we followed it up with a 1-0 win over Huddersfield to end our Premier League season. Next up was a chance to get our 2nd trophy for Man Utd and we did it deservedly as Pogba won us the game through an outside the box screamer. 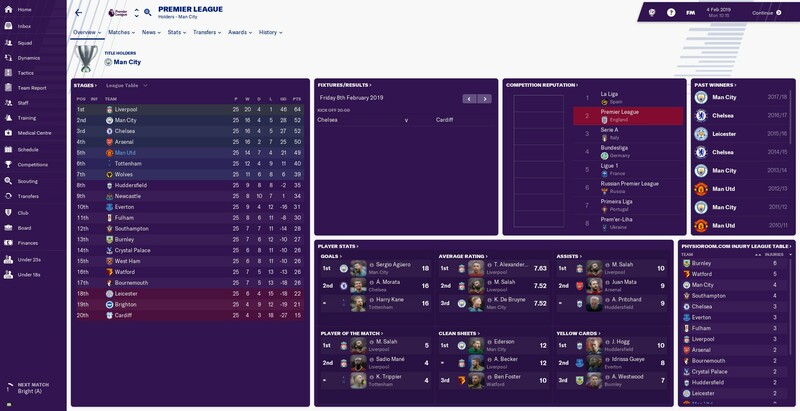 After we won our match, Chelsea drew 0-0 with Crystal Palace and all we had to do was win our final EPL game and we'd somehow end up 3rd in the league after a very competitive and strong season for the teams. We could've actually won the league in another season since there has been seasons where I've won the EPL with points in the 60s and 70s so our points total could've easily won it but Liverpool got to the 90s while our derby loss to Man City slashed our hopes of finishing runner-up. 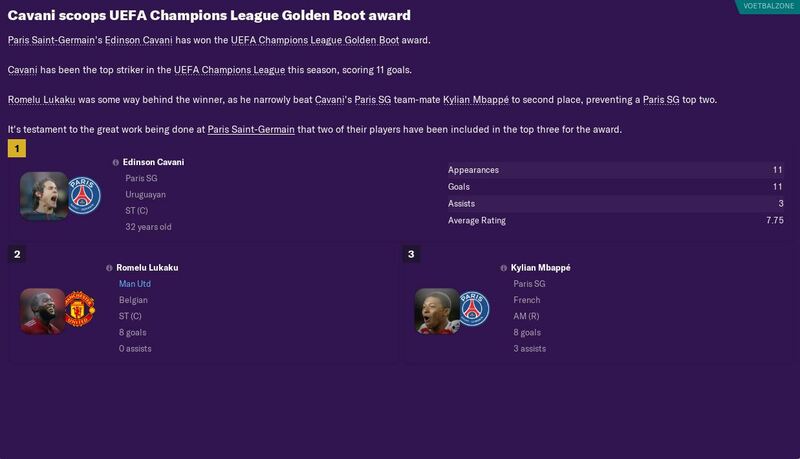 As we ended out winning the world's most prestigious domestic cup competition, we also managed to get one of our players to win the Golden Boot for it as Lukaku decided to get some goals in this competition while Rashford took out the Golden Boot for the League Cup. What a match which will undoubtedly be a spectacle in the final! Two huge rivals here are playing off in the Champions League final for the first time and we've got to win this as Liverpool are now only 1 Premier League title off us following their win and they have won 2 more Champion Leagues than us so this is a good time to get one back at them and heartbreak them, even more, following their devastating loss to Real Madrid last year. Sergio Aguero wins another Golden Boot with his impressive 33 league goals as he edges out Kane and Morata with ease, but don't worry because Marcus Rashford will win it next season! Two Man Utd players made the team of the season in the amazing De Gea while Lukaku somehow made it with a meagre 14 league goals but the real question is where was Marcus Rashford in this team? 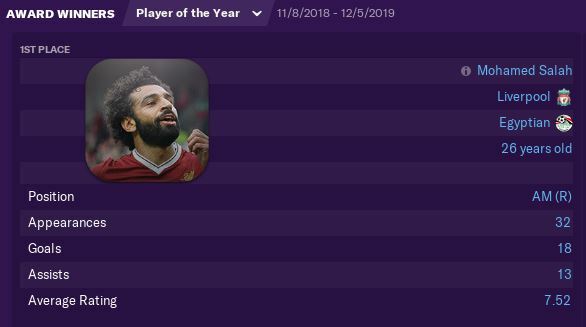 Salah unsurprisingly wins the award. Dunno what the difference is between the other one. 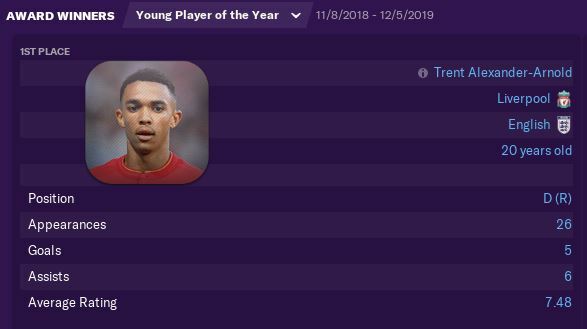 Trent Alexander-Arnold wins young player of the year after a phenomenal season. WE ARE CHAMPIONS!!! 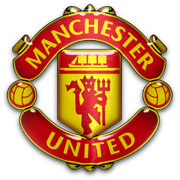 WE PRETTY MUCH HAVE KEPT OUT JOB SAFE BY WINNING MAN UTD THE CHAMPIONS LEAGUE AGAINST OUR ARCH RIVALS LIVERPOOL! It was a hard fought 1-0 win but a Raphael Varane header secured us the trophy. 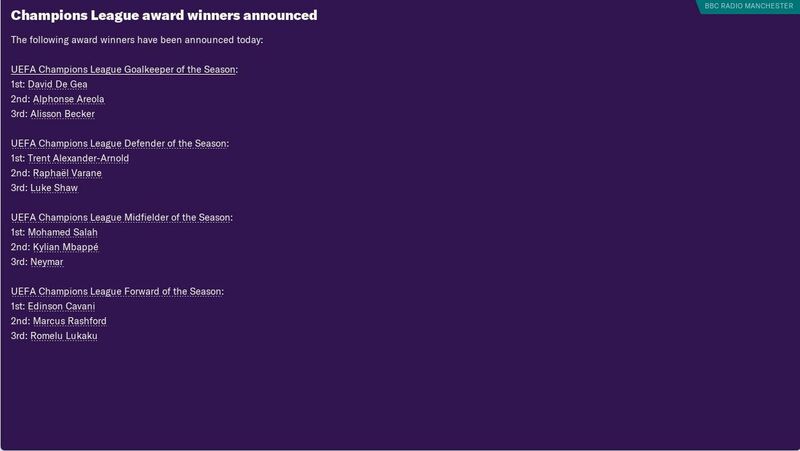 It's our first end of season awards as Man Utd manager in what has been a successful season because of our Champions League success. 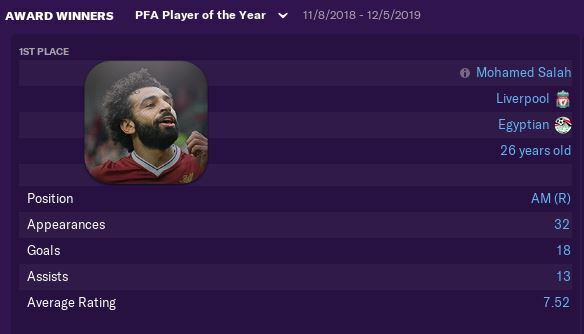 A player who was key to our success in the 2nd half of the season was Marcus Rashford, who won fans' player of the season while Pogba came 2nd after getting 10+ goals in the league season while Lukaku rounded off the top 3 after a decent goal tally from him. I can definitely agree that it was a memorable season as the team won the Champions League for the fourth time in history as we also tasted in both of the domestic cups. We should have done better in the EPL though but I'm sure we can do better next season. The squad dynamics are going great as there is an excellent dressing room atmosphere and very good managerial support which will undoubtedly help me in keeping my job in the future if needed to. 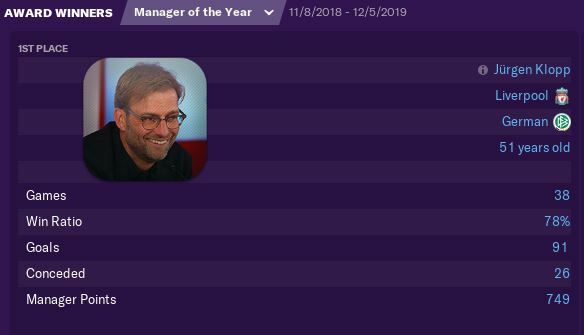 My job is now safe following our Champions League success and the fact we won the FA Cup and EFL Cup which gave us an extra edge. We've managed to extend our contract to 2023 which will inevitably give us extra job security. Liverpool won the title here in England but there were a few shocks around where Atletico Madrid take out the league as Inter win in Italy. In Germany and France, Bayern and PSG win the league as per usual, respectively. In Portugal, there was a very tight league race as Porto beat out Benfica due to the fact they beat them in an unusual league sorting rule as Sporting lie only 2 points behind in their recovery following a training ground fight initiated by fans which caused 7 players, which 4 of them where part of Portugal's 2018 World Cup squad to terminate their contracts. There was also a tight league race in the Eredivisie as PSV took out the title by +1 goal difference as Ajax finished out of the top 2 for the first time since 2001 except for when they finished 3rd in 2009 as they were only 1 point off 1st place. Construction is set to start for the expansion of Old Trafford as it is going to add 16K more seats to make it have a capacity of 91,635 people which is more than Wembley which will cost £97M and be completed by the start of the 2020/21 season. Who would've thought we completed the treble this season? It's just not your normal treble as you would've expected a league title, top domestic cup and the UEFA Champions League just instead of the league we won the league cup which sounds very similar. 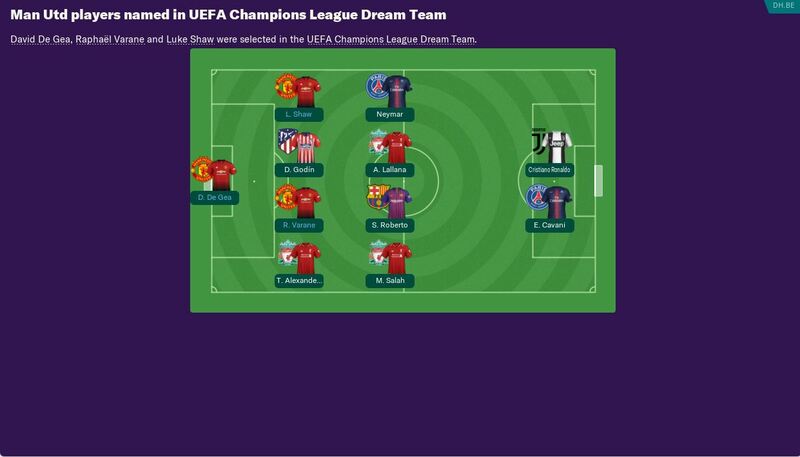 3 of our defensive players have made the dream eleven as De Gea, Varane and Shaw all make the lineup. Marcus Rashford has won the UEFA Champions League Goal Of The Tournament following his 26-metre effort against PSG in the semi-final in which we advanced by away goals. This season it is Edinson Cavani who won the golden boot while Lukaku came tied 2nd with Kylian Mbappe, a player we do have interest in. David De Gea deservedly wins the goalie of the season while Varane comes runner-up in defender of the season as Shaw came 3rd while Rashford was runner-up in forward of the season as Lukaku rounded off the top 3. We've had quite a few great wins in the UEFA Champions League and this was clearly the competition the players performed the best in as beat Atleti 5-0, 4-0 over Hoffenheim. Rashford and Pogba have sold the most shirts while Lukaku, Alexis and Martial round off the top 5. 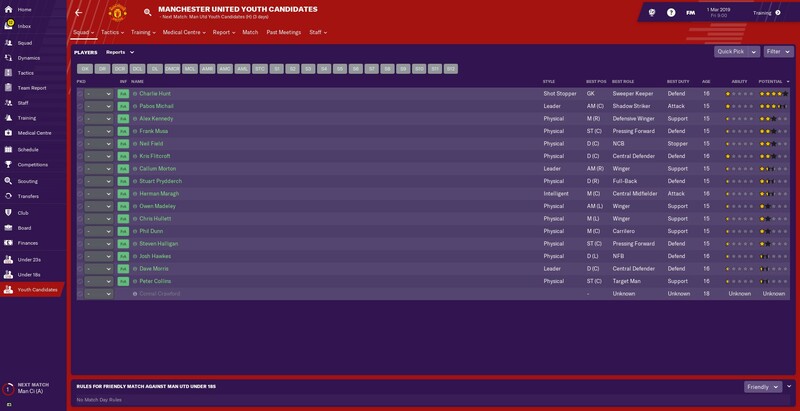 The u23s have won the division two title which means we will get promoted to the top division and we'll face all the big teams which will be great for the development of our young players. We had a future transfer agreed with him and I wanted to get him because not only is he a fantastic player but he's part Croatian which made me want to sign him even more. He's a great young player with very high potential and he's nearly Championship ability after he recently turned 17 a few months ago. He's a very versatile player with great attributes and I plan to give him a few runs in the first team. I really couldn't resist... This was a once in a lifetime opportunity to steal Mbappe from his home country and take him to the EPL and he is such a quality player who will definitely secure us the EPL title and hopefully even the Champions League. He's also now the highest valued player in the game with a value of £124M as we pretty much blew our whole transfer budget. A great young centre-back who's the only young player who's nearly as good as de Ligt and hopefully one day they'll get to play together as two world-class centre-backs. A great price for a player with 5* potential and this 16 year old defensive midfielder is ALREADY Championship quality and I can see him as a first choice defensive midfielder in a season or two as hopefully this homegrown kid can be with us for a decade or two. Gives great depth in the defensive midfield position and provides competition for that spot in the team which is very open up for grabs unlike our 4 attacking positions where it's very unlikely Rashford, Martial, Isco and Mbappe are going to be taken over while Pogba holds command of the midfield position. We needed another right-back following Antonio Valencia's departure and he filled the void as he wouldn't cost much while we didn't have to pay much for his wages and he would provide competition for Diogo Dalot. We needed a new centre-back to partner Varane following Lindelof and Bailly's departure and why not sign Pavard who played with Varane in their World Cup winning squad as he was quite a bargain as he had a cheap minimum fee release clause. Another player we got in from Real Madrid, just this time on loan. He's quite versatile as he's very natural in CM and CAM while he could even do a job on the wings as he is a good backup for Isco as he got injured which will rule him out for a bit of the start of the season. Another player on loan that gives us depth in the wings as some of our younger players have gone out on loan. Obviously he's not going to knock out Pogba in that position but he's got a good shot at being our first choice midfielder and he's a very good 2nd choice in midfield in case Pogba gets injured and I might even consider getting him in permamently with his 4 1/2* potential. Signed at the same time along another high potential Italian centre-back wonderkid, Leonardi has very talented attributes which goes along his 5* potential. We decided that getting two of some of the world's best players wasn't enough so we've managed to get in Alaba for a pretty good price and he offers us something very unique at left-back with his amazing physical attributes which will last him a fair bit into his thirties as he will play an important part in getting extra goals from left-back. The sale was sanctioned for the purchase of other players as we no longer needed him following Marcus Rashford's surge to become the first choice striker. £60M was a very good price for someone who was no longer going to be our first choice striker. I'm extremely pleased with this deal as Nemanja Matic was starting to head into his 30s and although he did a good enough job, there was definitely other defensive midfielders who could do a good job so £45M for him was something I could never say no to. Following a good season, I decided to sell off Bailly as I felt we could get a better centre-back and wouldn't to give more of a chance to de Ligt to make a claim for a centre-back spot. Anyways, we all know that once Bailly hit his 30s and no longer was able to get a work permit, no one would want to buy him as they can't get a permit while we'd just have to let his contract run down and that wouldn't be good financially for the club. Despite only selling him for £36M, Real Madrid did not ask for any selling team wage contribution so we pretty much got rid of having to pay £400K per week in wages which essentially freed up the budget for Mbappe and Alaba along with the other players we sold. He was never going to be someone who was going to be a first team player and we got offered good money for him so I decided why not since he can't knock off Pogba while we now got two great young players in defensive midfield. No longer needed as a backup centre-back following the signing of Filip Benkovic who will probably partner de Ligt or even Pavard. We finally have managed to get him out of the club and was never a player we wanted or needed and completely useless and damaging for the club. Finally got another deadweight player out of the club with his frustrating wages which reached over £100K per week even though he's not a great player who is worth that wage. Why not make a profit on Romero as we don't need him and he's just going to start declining, plus we got a young player who could do a decent job in the very unlikely case of De Gea getting injured. Big loan deal here, but with all our signings in midfield positions, it would be hard to find him game time and he needs to prove himself elsewhere other he might get sold as he's only 3* potential with a 2 1/2* ability. 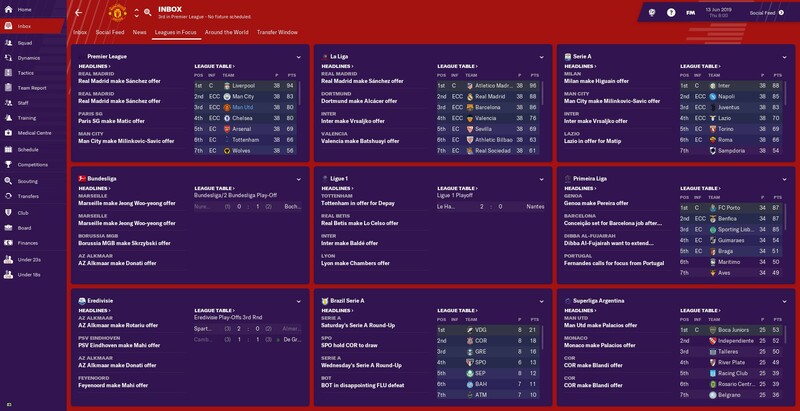 There is a lot of other players who have gone out on loan but it would take forever to list so I'll just leave an attachment of the save so you can also look at the update of how it's going and the other players who are going out on loan. We've had a very good pre-season which somehow we went undefeated despite playing so many strong teams. It was a very long and gruelling pre-season as we had around 20 matches and we had to deal with fixtures pretty much every 2 days. I am very impressed with the team's performances as we beat Monaco 4-2 and PSG 2-0. After that we got a few breaks in between matches before having 3 games in a row against Portuguese teams followed up with wins over Belgian teams. We finally got a lighter schedule as for only a week, we had 2 days between matches but to end off the month. We beat all of the top Spanish and Italian teams, except for Real Madrid and Juventus, which who we drew with. Obviously this season we are the title favourites as we recently won the UEFA Champions League and arguably got the strongest team in Europe. Aguero seems to be the clear favourite to win the Golden Boot while Kane is in a very good shout of doing so while they think Rashford is only in the mix for it. Salah has been tipped to win the Top Player this seaosn but Mbappe has a very good chance of doing so too and Isco is also within a shout of doing so as well. Making Mbappe the favourite was a no-brainer but they rate Trent to give him a good run for the money while Marcus Rashford is AGAIN only within the mix. We've got Marseille in the UEFA Super Cup which should be a very winnable match and a 2nd opportunity to get another trophy following the Charity Shield. This is definitely going to be an interesting match in our rematch of the UEFA Champions League final against the league winners Liverpool. A good win for the team here as we survive Paul Pogba's penalty miss via Anthony Martial's man of the match performance in a 3-1 win against 2-time defending Champion League runner-ups. 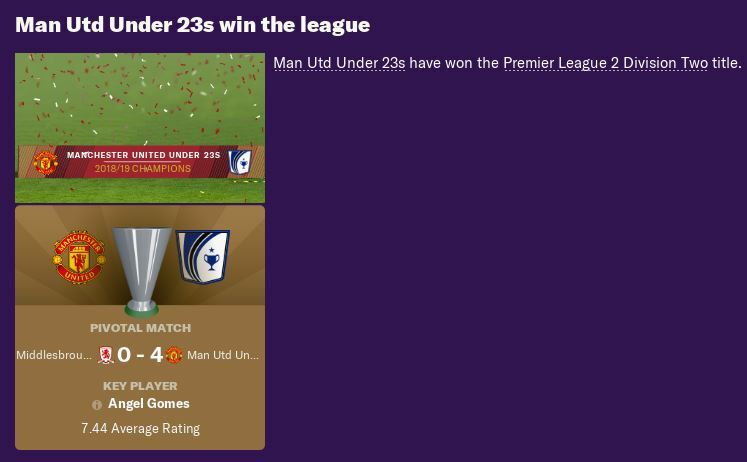 We managed to seal the European Super Cup title with two goals in extra time thanks to Pogba actually converting a penalty and Rashford finishing it off. We've had a great month which was full of wins and 2 titles. After our Liverpool match, we had a near-upset against Bournemouth away from home but we survived following Lazar Samardzic's stoppage-time debut goal. Following the Marseille match, we got in a good-enough 1-0 win over Everton in our first home game of the season courtesy of a Rashford goal. We ended off the month with a humungous 6-2 win over Fulham where Rashford got a hattie and a faultless 4-0 win over West Brom. We stand top of the table via goal difference but even on points with Man City and Newcastle while Liverpool don't trail far behind but the London group of Chelsea, Spurs and Arsenal are starting to dig themselves into a hole. 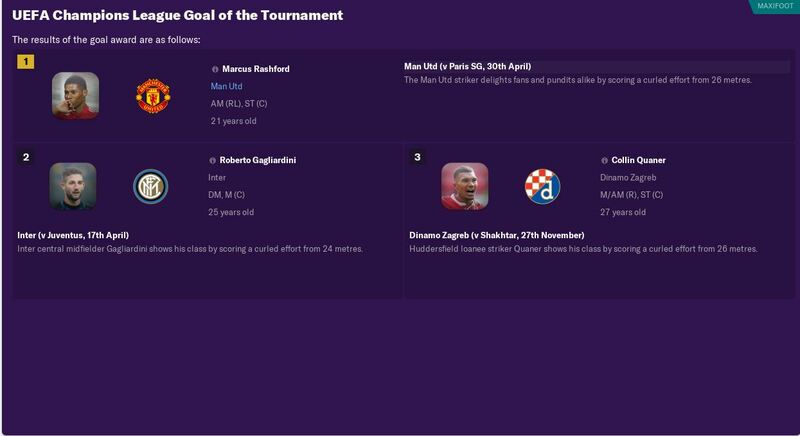 In terms of the Golden Boot, Marcus Rashford is tied with Aguero and he's got a good chance of winning it while Mbappe is close to getting most assists as well as winning the most man of the matches and having the highest average rating.